I'm in Volterra, my favorite small town in Tuscany, sitting under rustic, noble stones at the base of a palace that made commoners feel small six centuries ago. Bats burst through the floodlights amid ghostly towers held together with rusted iron corsets. These stones have soul. The countless peasant backs they bent so many centuries ago gave to future generations the architectural equivalent of fine wines — something to be savored and pondered in solitary moments like this one. 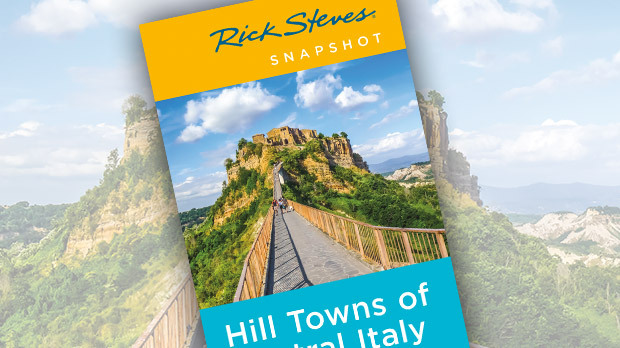 But more than 2,000 years ago — before vampires took over the town — Volterra was a key trading center and one of the most important Etruscan cities. 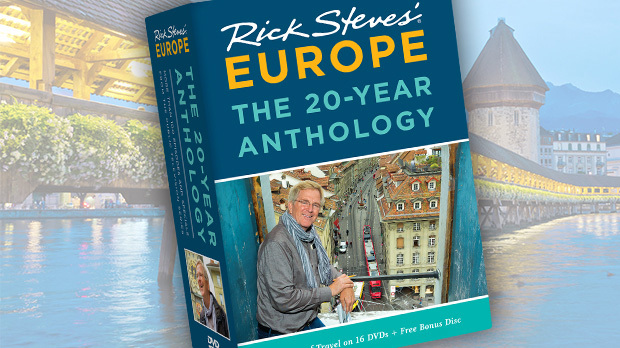 (Tuscany is named after the Etruscan people, who lived here centuries before it was conquered by ancient Rome.) The city was protected by a four-mile-long wall — twice the size of the wall that encircles it today. 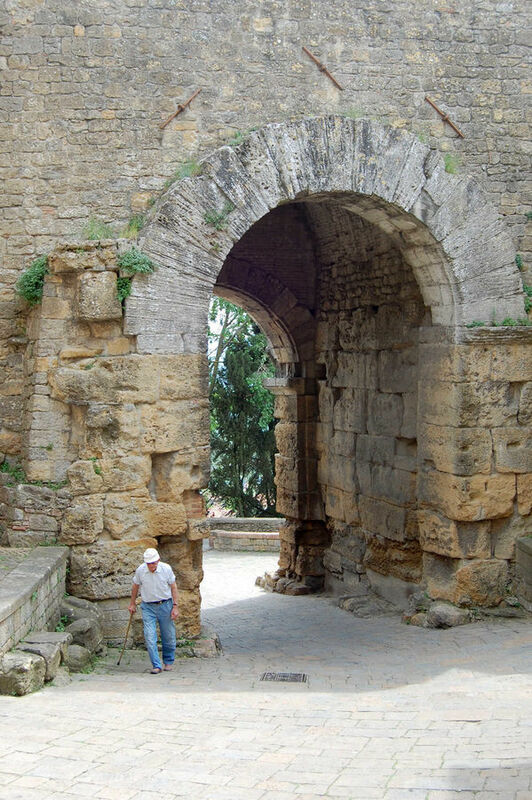 You can still see its mighty Etruscan gate, built of massive stones of volcanic tuff. Its Etruscan Museum is filled with precious artifacts from centuries before Christ. You'll see etched mirrors, intricately decorated pot handles, and exquisitely crafted jewelry. The museum's extensive collection of urns — with subjects lounging as if munching grapes with the gods at some heavenly banquet — is a reminder that the Etruscans believed the afterlife could be fun. Volterra's 800-year-old city hall claims to be the oldest in Tuscany. Civic palaces like these were emblems of an era when city-states were powerful. They were architectural exclamation points declaring that townspeople, rather than popes and emperors, were calling the shots. Alabaster has long been a big industry in Volterra. Softer and easier to work than marble, this translucent mineral was traditionally sliced thin to provide windows for Italy's medieval churches. At the Alab'Arte shop, across from the Etruscan Museum, you can watch artisans at work. Because of its alabaster heritage, Volterra attracted other types of artists, who brought with them a rich variety of crafts. On Via Porta all'Arco, or "Artisan Lane," book binderies and paperies compete for shoppers' attention with shops selling handmade jewelry, leather, and bronze. Unlike other famous Tuscan towns, Volterra feels real and vibrant. On the opposite end of the spectrum is the touristy town of San Gimignano. About midway between Siena and Florence, San Gimignano was a natural stop for pilgrims en route to Rome. Today, tourists replace pilgrims, and it can be really crowded. Locals seem fixated on tourist dollars, and much of the town's architecture is actually faux medieval — reconstructed in the 19th-century Romantic Age with a flair for the fanciful. But San Gimignano is so photogenic and easy to visit, it remains a good stop. I find the place enchanting at night. The town's claim to fame is its series of striking towers. In medieval times, rich people fortified their homes by building towers, which provided a handy refuge when ruffians and rival city-states would sack the town. Pointy skylines like San Gimignano's used to be the norm in Tuscany. Visitors enter the town through the main gate, Porta San Giovanni. The traffic-free cobbled main drag leads to Piazza della Cisterna, named for the cistern that supplied the old well in the middle of the square. Rustic-yet-proud facades crowd in a tight huddle around the well. This has been the center of town for a thousand years, and it's still the place to hang out. Farther along, on the main square, are twin 10th-century towers — among the first in town. The Civic Museum is worth a visit for its festive frescoes, classy painting collection, and 200-foot tower, which rewards climbers with commanding views and a delightful stony loggia. Of the town's original 72 towers, only 14 survive. 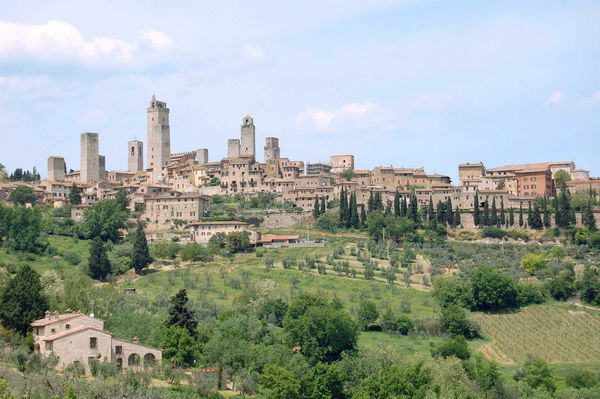 When San Gimignano fell under the realm of regional bully Florence, most of the towers were torn down, and the town lost its status as a vital trade route stop. It never recovered, and poverty left it stuck in a 14th-century time-warp. That explains San Gimignano's popularity and prosperity today. Volterra and San Gimignano both make a good escape from big, museum-packed Florence, offering travelers an engaging mix of surprising beauty, rich history, and Italy's rustic good life.